1846 George Hood Established by George Hood, who purchased the land from Mr. Randle-Wilkinson in 1831 and build the manufactory. 1851 1863 William Emberton After the death of William Emberton in 1867 the works were carried on by his sons. 1882 1885 James Emberton 1882-85 continued by James Emberton. 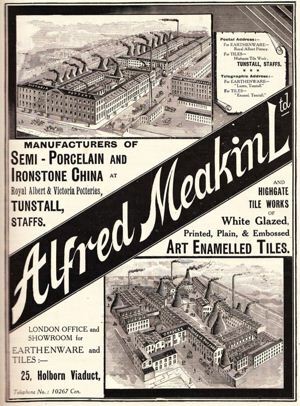 Earthenware manufacturer at the Highgate Pottery, Brownhills, Tunstall, Stoke-on-Trent. They produced the usual kind of ware and also specialised in pottery for the Indian and Far Eastern markets. In 1871 the factory employed 47 men, 22 boys, 27 women and 27 girls.